William Edward Forster, the only son of William Forster, a Minister of the Society of Friends, was born in Bradpole, Dorset, in 1819. Forster was a passionate social reformer and was an active member of the Anti-Slavery Society. After receiving a Quaker education in Bristol and London, Forster trained as a lawyer. Forster took a keen interest in politics and was friendly with several well-known radicals, including Robert Owen, Thomas Cooper and F.D. Maurice. In 1835 Forster changed careers and entered the wool trade. Six years later Forster became a partner in the woollen business in Bradford. Forster left the Society of Friends when he married Jane Arnold, the eldest daughter of Thomas Arnold, in 1850. An active member of the Liberal Party, Forster was elected MP for Bradford in 1861. Four years after entering Parliament, Forster became Under Secretary for the Colonies under Earl Russell. Following the 1868 General Election, William Gladstone appointed Forster as Vice-President of the Committee of Council on Education. Forster therefore had responsibility for carrying through the House of Commons the 1870 Education Act. When Forster introduced the bill on 17th February 1870, he pointed out he was not doing away with existing schools, but helping to add schools in those areas where they were in short supply. In Forster's words: "to fill up its gaps at least cost of public money". As a result of Forster's Education Act, School Boards were given the power to examine the provision of elementary education in their district, provided then by Voluntary Societies, and if there were not enough school places, they could build and maintain schools out of the rates. The main opposition for these measures came from members of Forster's own Liberal Party, who argued that education should be compulsory, secular and free. In 1880 Forster became chief secretary for Ireland. He was constantly criticised by Irish MPs in the House of Commons and his life was threatened when he introduced measures to deal with Irish rebels. When the majority of Gladstone's cabinet decided in April 1882 that the Irish leaders should be released from prison, Forster resigned from office. 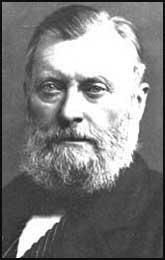 William Forster remained a strong opponent of Irish Home Rule until his death in 1886.